COSMO QUICKIE: This story at a glance! 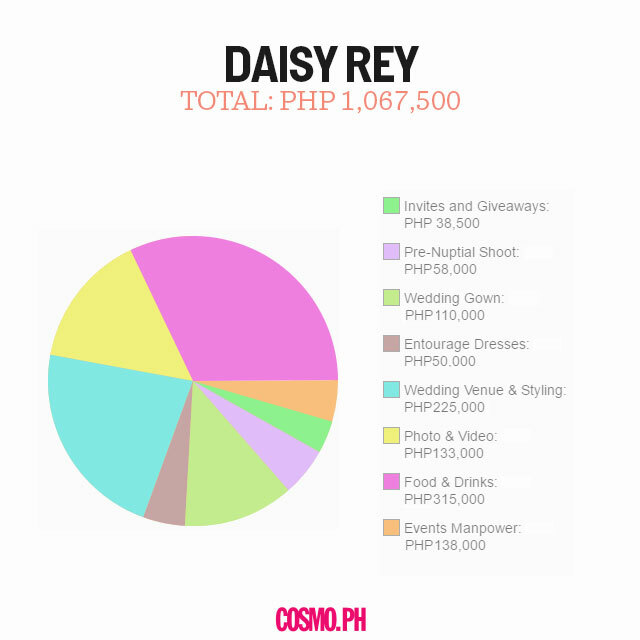 30-year-old Daisy Rey had a garden wedding in Silang, Cavite and spent a little over P1M. 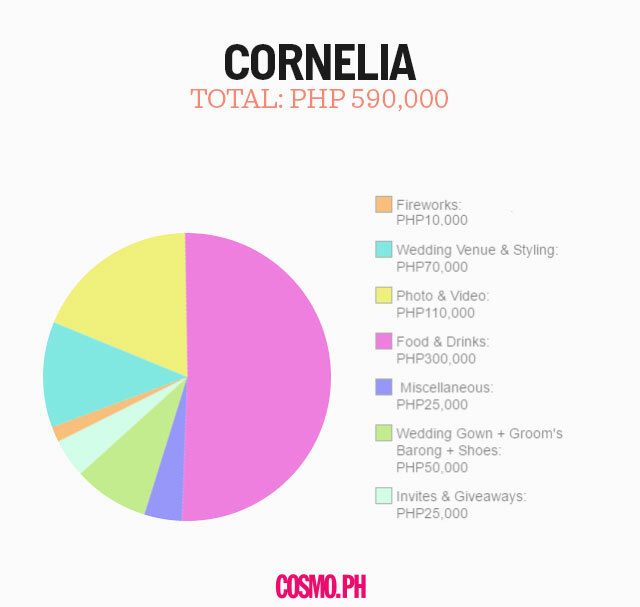 34-year-old Cornelia spent half a million for her Nasugbu, Batangas wedding. 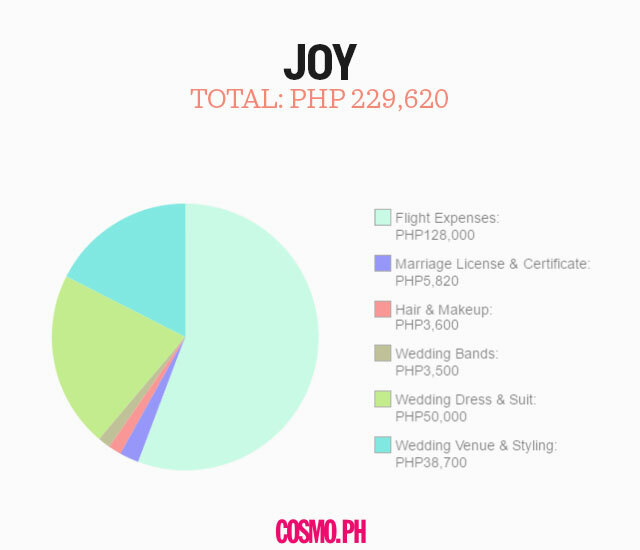 35-year-old Joy went to LA for a civil wedding and spent less than P300,000. 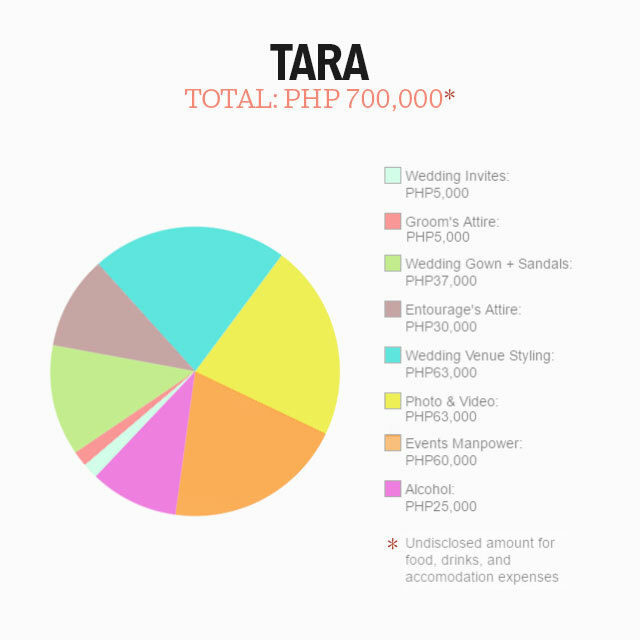 30-year-old Tara spent roughly P700,000 for her beach wedding in Laiya, Batangas. 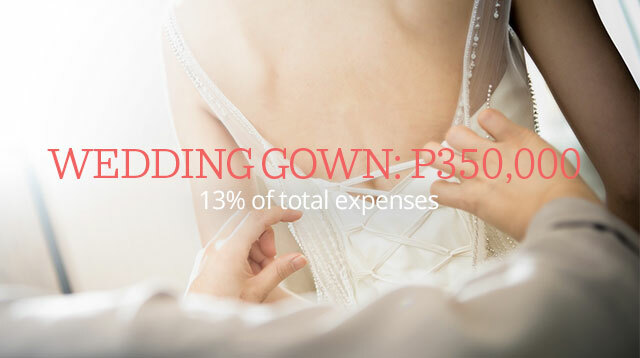 26-year-old Bianca spent almost P3M for her wedding in Intramuros, Manila. Where did you get married? What kind of wedding did you have? Why did you decide to have this kind of wedding? I never wanted a church wedding; in my head, it was always going to be in a garden—feminine, delicate, and romantic. Also, one of the perks of a destination wedding is you’re forced to trim down your guest list—not everyone will make an effort to drive two hours from the metro (three with bad traffic!) to attend your celebration. It’s kind of an instant filter—you get to know your real friends, and you cherish them more for their efforts. Did you have a wedding planner? Why or why not? Yes. I consider myself lucky because he is also my brother-in-law, so our relationship went beyond just planning the wedding—I also leaned on him multiple times whenever I felt stressed or lost in the whole planning process! I got him specifically because he’s family, he specializes in flowers (he used to be a florist by profession), and he had all the contacts from when he did wedding planning full-time. Who paid for your wedding? My husband and his parents shouldered the bulk of expenses, while I covered certain items I volunteered for. I wanted to pay for my wedding dress, my bridesmaids’ dresses (including my mom’s), the invitations, and souvenirs. Take note that these weren’t random; I specifically chose these things because I wanted to have control over them. Like, no one could tell me my dress couldn’t be in blush, or dictate that my bridesmaids couldn’t have separates with pretty floral skirts. The invitations were also beautifully illustrated in watercolor, and I had specific instructions for the artist. Because I was paying for these things, I didn’t feel guilty about splurging on them. They were kind of a gift for myself. My husband and his parents, on the other hand, split the pricier stuff: venue, photo and video, catering, etc. My husband was very hands-on with the planning (aka he said yes to most of the stuff I wanted—within reason, of course! LOL! ), so I will always be grateful for him and his parents making my dream wedding possible. How long did it take you (and your partner) to save up for it? We got engaged in September 2013, and got married in January 2015. When my husband proposed, he already had enough savings to pay for the wedding with the help of his parents. As for me, I was paying in installments for my gown and bridesmaids’ dresses throughout the engagement period (Yes, that’s allowed!). I still remember how naïve and idealistic my now-husband and I were. After getting engaged, we were like, “Let’s just spend P300,000 and invite 100 guests.” MAJOR LOL! Granted, this could have been possible if we let go of a lot of things—but we both agreed we wanted the venue so much, and our next priority was the catering. Great ambience and food were on top of our list, and we weren’t going to settle on anything less. I ended up paying a little less than 200,000 for all my “assignments,” and my husband and his parents spent the bulk at roughly P1M. How did you determine your budget? What kind of research did you have to do? We had to prioritize and identify non-negotiables. For us, they were the venue and food; we wanted our guests to enjoy! We attended one bridal fair where we booked some suppliers at discounted rates (take advantage of fairs!) and the rest, we simply Googled. I stayed away from word-of-mouth because it was a form of peer pressure for me. What worked was browsing suppliers’ folios online with my husband, and just going with our gut. It was our party, so we were doing it on our own terms. Our wedding planner/my brother-in-law also gave us great suggestions. What did you skimp/splurge on, and why? Splurge: Venue (a beautiful garden in chilly January—it was so cold, we gave away shawls as souvenirs! ), food (we needed to have our pumpkin soup and Spanish sardine pasta), photo and video (we wanted amazing photos to remember our day by), flowers (the guests were allowed to take them home—including the mason jars I bought from Divisoria! ), lights and sounds (to set the entire mood), tents (it could’ve rained—we weren’t going to get stressed on our wedding day), and invitations (I asked a watercolor artist to paint the tree in the garden where I got married; it’s an unnecessary splurge, but it made me so happy. The tree and flowers she painted were reused for the souvenir cards and table placeholders.). Skimp: We got a DJ to play our favorite music (downloaded all the songs we wanted him to play) instead of getting a live band or orchestra; I asked my bridesmaid friends to do their own hair and makeup. Please provide a cost breakdown of your expenses. Which expense shocked you the most? NOTHING. <3 Oh, maybe I would have eaten more, haha! What are some of your wedding tips or secrets? 1. Go to bridal fairs to take advantage of discounts. 2. Book your venue first. I had no idea weddings were booked years in advance! Remember: You take a big risk if it’s an outdoor venue, because it might rain. You’ll end up spending more because you have to rent tents. 3. Write your own invitation copy and ceremony liturgy/copy (in coordination with your pastor/priest/presiding minister). There are so many unnecessary add-ons that just prolong the ceremony. I personally ditched the whole veil/cord/coins tradition and went straight to the vows. We had an ecumenical service, so it wasn’t as strict as a Catholic ceremony. I literally wrote and edited the actual wedding program (except for the homily/lecture). I am an editor, so this was a non-negotiable. Oh, I also copy-edited the invitations, souvenir copy, and table placeholders. Why hire someone to do it if you can do it for free? P.S. I was also the one who did the layout and printing of the souvenir cards and placeholders. I was a DIY bride too! 4. For the entourage: If you’re going to pay for your bridesmaids’ dresses, ask them to cover their hair and makeup to save on expenses. For the guys, buy the ties, and ask them to come in a classic black suit. 5. Bring a nice handkerchief. Believe me, you will cry! 6. Create a secret wedding Facebook group (Create an Event) so people can RSVP there (because nobody will RSVP, promise). It’s also practical because you can post a map there, as well as weather updates, additional instructions, etc. My husband and I are both Catholic. We both grew up in Batangas so we agreed to get married there. No, but we had an on-the-day coordinator—a friend. We opted out of having a wedding planner because it was expensive. Plus, we wanted to be really hands-on, especially because my husband has a knack for DIY projects. We covered half of the expenses while the other half was paid for by our family and friends. Instead of giving us gifts, some of our friends paid for our wedding rings, cakes, flowers, food, drone, and even the videographer! Some of them even gave us cash—we are so lucky to have such loving people in our lives! We were together for 15 years before we decided to get married so honestly, we didn’t really save up for the wedding day. But a good friend told me that if we both decide to get married, we will be entering a new life with God at the center, and reminded me that He will always provide. And He did! Our initial budget was P300,000. We thought it’d be enough because my husband’s parents gave us a pretty good chunk in the beginning. But of course, it wasn’t. 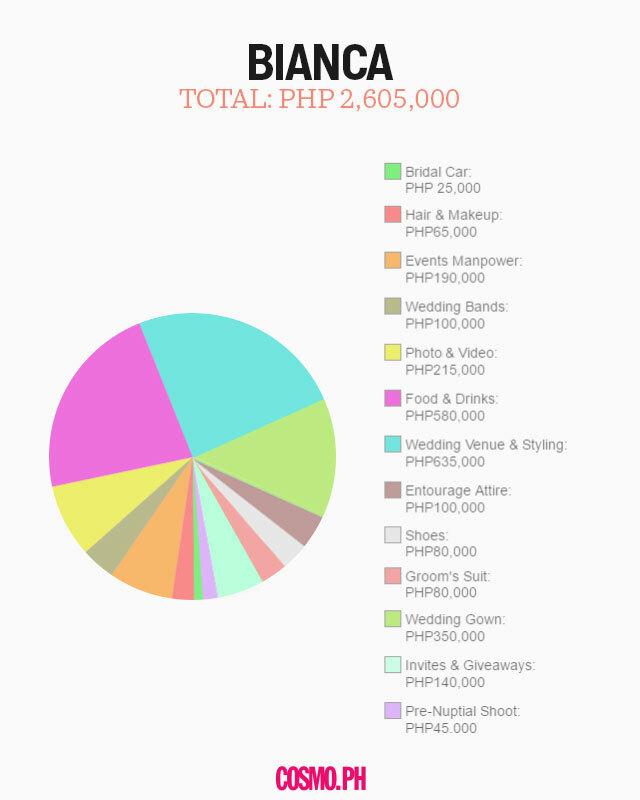 Our wedding cost ended up being around P550,000 to P600,000. We attended wedding fairs to compare the prices of different suppliers. I also read wedding blogs, looked for suppliers, asked about promos, etc. I got hooked on Pinterest, too! Skimp: Flowers and wedding gown—I really just wanted a simple one. Splurge: Food! It’s the number one thing guests remember. LOL! The caterer…but in a good way. I thought it’d cost us more! We should have hired a professional on-the-day wedding coordinator. Nothing bad happened, but we were almost late for the church ceremony! 1. Be firm about what you want for your wedding. Don’t let others make decisions for you. 2. RESEARCH! Join wedding chat groups if you have to—yes, they exist. 3. Don’t forget to ask your partner for his opinions. He might have better ideas. 4. If things don’t go as planned, don’t panic! Go with the flow lang. 5. Pray. And try not to kill each other. San Francisco City Hall, California, U.S.A.
My husband and I didn’t want a big, traditional wedding. We just wanted something simple, low-key, and intimate. To us, that’s more meaningful. No, we didn’t feel it was necessary since our ceremony was small and simple. My husband and I paid for our wedding. We didn’t specifically save up for the wedding, but because we’ve always just been good at saving, when we did decide to get married, we had enough money to spend. We didn’t have one. Because our celebration was so small, we knew we wouldn’t go overboard. What kind of research did you have to do? To be honest, we didn’t have to do a lot of research. We checked online for the costs of the marriage license, ceremony, and flights. For our outfits, we window-shopped first before purchasing anything. I have a brother in San Francisco so he recommended some restaurants for our dinner reception. Skimp: Rings. We re-set and reused heirloom rings from both our moms. We also skimped on the video and photos. Our outfits were RTW since we didn’t need formal attire anyway. Splurge: Plane tickets and dinner reception! Overall, we weren’t too shocked by our expenses. The marriage license and ceremony fees were surprisingly cheap though, considering how nice San Francisco’s city hall was! We wish we had more family members present, but other than that, we’re happy with how we got married! 1. List your negotiables and non-negotiables! 2. Research and know your limits. 3. Remember to leave some money for your life after the ceremony. Ever since I was a kid, I wanted to have a beach wedding. Plus, my husband and I love to travel to different beaches on weekends, so that’s why my non-negotiable was to have a beach wedding. Did you have a wedding planner? Yes. I tried coordinating everything myself first, but I had a wedding planner to help me coordinate with suppliers. Eventually, the wedding planner handled everything. My husband and I paid for our wedding completely. Our initial budget was P700,000, but of course, it went beyond that. How did you determine your budget? We asked different friends and suppliers. I checked out forums on Female Network, and attended two to three wedding fairs to canvas rates. I also looked for suppliers online and emailed them. Skimp: Flowers! I knew we wouldn’t be able to use them naman so we made sure our setup wasn’t flower-heavy. I also didn’t spend much on my gown because it was impractical to spend P80,000 on a dress I’d only wear once. I got my shoes from Charles & Keith lang 'cause I wanted to own something I’d still wear after the wedding. Splurge: Drinks! I wanted to make sure all my guests had fun. We also hired a well-known host to make sure that the program was perfect. Since we didn’t spend much on flowers, I wanted to make sure our reception’s design was still pretty so we invested in good chairs and tables. The flowers—didn’t know they could be that expensive. 1. Use the “friend” card! You’ll be able to save a ton. 2. Be patient. Take your time looking through all your options before booking anyone. 3. DIY everything you can! I made all the giveaways, painted some parts of the invitation, designed the entourage’s dresses, made my wedding cord from scratch, asked my best friend to style me for my pre-nup shoot! And that’s just the tip of the iceberg. It was just my dream wedding to get married at a pretty church like Manila Cathedral! Yes! My fiancé was based in Cagayan De Oro and I was in Manila, so we really needed help with everything. Our wedding planner did everything for us. She gave us a wedding handbook; it had a to-do list, list of suppliers, guest list, etc. It was my wedding bible! My husband and I paid for about 80 percent of our wedding, and the remaining 20 came from our families. P2,000,000…but we ended up spending P3,000,000. I mostly just browsed different websites and blogs, and picked up a couple of bridal magazines. Splurge: My wedding gown! <3 No regrets. Nothing. I would do it all over again.